Space Shuttle Enterprise has been strapped atop the 747 Shuttle Carrier Aircraft (SCA) that will soon fly NASA’s path finding orbiter from Dulles Airport to her new and final home in the Big Apple – and to the delight of Dulles Airport flyers and visitors she’s all primed at a spot offering a fantastic public glimpse of the historic last flight ever of NASA’s 1st space shuttle vehicle. Have you ever dreamed of seeing the magnificent sight of a NASA space shuttle on top of a 747 Jumbo Jet up close with your own eyes ? Imagine this view on take off ! Well, right now anyone can get that superb glance of the mated duo quite simply from one of the upper level parking decks at Dulles Airport. And you don’t need a press pass, plane ticket, intrusive TSA pat down or a secret service security clearance. And because of inclement weather, you will have a few extras days to catch history in the making of a sight that will soon evaporate into the ether of time. Only a Stak Trek era holodeck with bring it back. After setting up to photograph Enterprise from the parking deck, I was joined within minutes by more than a dozen enthusiastic folks and kids ! 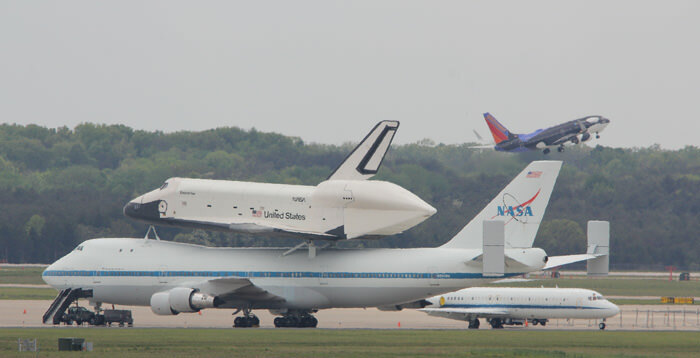 NASA has postponed the planned Monday, April 23, departure of Enterprise from Dulles for New York City and touchdown at JFK Airport because of expected bad weather at both ends of the Washington to New York itinerary. Universe Today has been told that NASA is now aiming for a Wednesday departure, weather permitting. Right now and continuing over the next few days, supremely lucky passengers seated aboard arriving and departing jets at Dulles are enjoying a truly stupendous bird’s-eye view of the winged NASA orbiter that most aerospace fans can only dream of. Just be sure to sit on the correct side on the plane. Check out the photos herein taken from the Dulles Daily Parking Garages taken by myself and fellow space photographer Brent Houston with invaluable assistance from space photographer Walter Scriptunis II. In a first-of-its-kind “Shuttle Shuffle”, shuttles Enterprise and Discovery swapped spots at the Smithsonian’s Steven F. Udvar-Hazy Center, Thursday, April 19, 2012, in Chantilly, Va.
Enterprise was first towed out of the Smithsonian’s museum display hanger in the early morning. The pair of shuttles then met for a historic nose to nose rendezvous – lasting just 4 hours. Finally, Space Shuttle Discovery was hauled inside to the prestigious spot formerly occupied by Enterprise. Since 2003, Enterprise has been the centerpiece at the Smithsonian’s National Air & Space Museum Annex in Virginia. Enterprise is named in honor of the fictional Starship of galactic exploration from the immensly popular “Star Trek” science fiction television series of the 1960’s. The Shuttle Enterprise rolled out in 1976 with the cast of Star Trek ! After landing at JFK Airport, Enterprise will be moved to a barge for a seagoing journey to her permanent new home at the Intrepid Sea, Air, and Space Museum in Manhattan. It breaks my heart! This beautiful cosmic eagle will always be flying in my heart. What a travesty this decommissioning of our Shuttle Program has been. Though, if it must go to a ‘sanctuary’ what better place than the Manhattan’s Interprid Sea and Air Museum. Wait only one place: California.